Shell V-Power Racing Team boss Ryan Story has described his team’s twin pit lane issues as an ‘unusual’ problem which they have not encountered before. Both race winner Scott McLaughlin’s #17 Mustang and runner-up Fabian Coulthard’s #12 Mustang are under investigation for a breach of the new-for-2019 rule regarding engagement of a line locker during pit stops. Supercars technical staff observed the handbrake system fail before being re-engaged during each of the Kiwis’ compulsory pit stops, although any penalties are expected to be levied against the team rather than the drivers’ specific race results. Story explained that the failure was due to the cars stalling, although he was not sure why what he suggested is a proven system would have had such a problem. “Both cars had unexpected stalls in the pit lane so we’ll wait and see what happens,” he told Speedcafe.com. “The penalty there is, as I understand, established to be 30 points per car on the teams’ championship and a $3000 fine, so if it comes to it, we’ll obviously cop it on the chin. “But it’s certainly not something we’ve seen before with the system we’ve had in place for some time, so (it is a) bit of an unusual one. 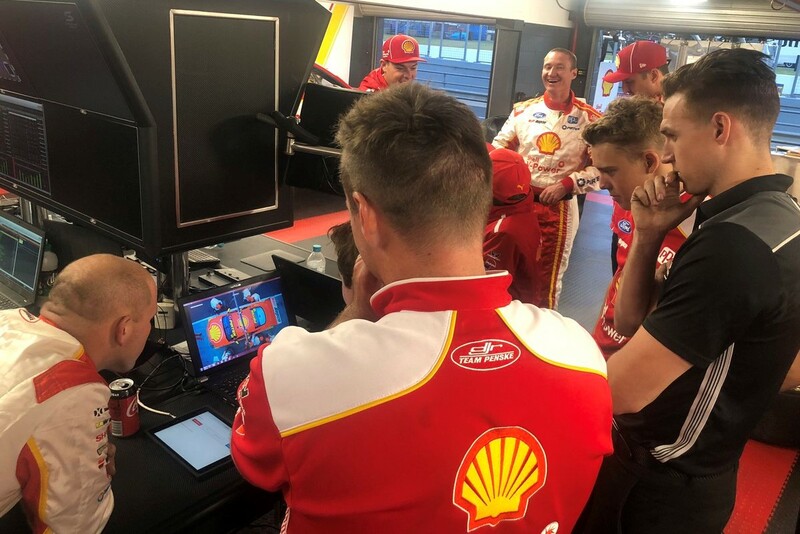 The episode is a slight blemish on what was an otherwise outstanding day for DJR Team Penske and McLaughlin in particular. The 25-year-old led Coulthard in a one-two in each of Practice 3, Armor All Qualifying, and Race 9 of the season, after they finished Friday afternoon’s second practice session in reverse order at the top of the timesheets. “We’ve had solid pace at Phillip Island for the last couple of years and in particular two drivers who are especially strong here, two of the strongest in the field when you go back and look at the past results,” observed Story. Both the Stapylton Mustangs had gapped the field easily in the opening stages of the 120km race, but more impressive was McLaughlin’s 1:29.2292s pole lap which put him almost six tenths up on Coulthard and almost another three tenths clear of Tickford/Supercheap Auto Racing’s Chaz Mostert, who qualified third. That result coincided with Triple Eight’s Shane van Gisbergen qualifying only ninth and Jamie Whincup languishing in 17th, and Story was somewhat surprised by the margins to the rest of the field. “A little bit, yeah,” he responded when asked if he was surprised. “I think there’s clearly a couple of folks who probably aren’t quite where they’d want to be, or certainly where they would have expected to be, and that’s the nature of these things sometimes. There is little prospect of McLaughlin or Coulthard themselves being penalised, with Supercars Head of Motorsport Adrian Burgess having already all but dismissed the prospect as he explained the incident on television during the race. “With both of the pits stops, our guys in our bunkers looking at all the telemetry on both cars there,” said Burgess. McLaughlin and Coulthard continue to sit atop the championship table, with the former’s lead now 136 points and the latter 65 clear of David Reynolds, who climbed to third with a finish of fourth in Race 9 from 12th on the grid.